Angular is a MVC JS framework, it handles a lot of stuff out of the box. Its most notorious feature was the two-way data binding (dropped with Angular 2). React is a JS library that helps you handle views (so, just the V in MVC). Basically, React comes with the concept of component, which has properties. It’s more lightweight, doesn’t handle a lot of things out of the box, but IMO, it handles enough. Angular is centered around the concept of application (Angular v1 at least), React is centered around the idea of a component. That’s the main difference for me. Some talks about Ember, Meteor, etc., they are another thing, used for another purpose, so it’s hard to compare. I learned Angular (v1) first because the concept of components was hard to understand (for me). Angular 1 was simpler in my mind: you build an application, your data is bound to the view through a controller. You can do something that works really fast. Now, I stopped working with Angular: while it’s great to have something working in a short notice, Angular do things in the background, and it’s sometimes, it’s hard to handle / to understand. 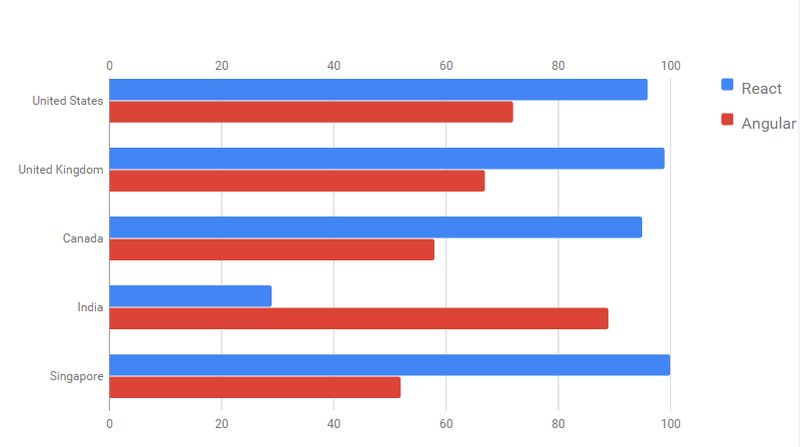 The applications I made with Angular (v1) are harder to maintain too. React is light, you build components that (together) make an app. You can reuse those components, put components into other components, etc.. You can easily find components (as npm/yarn packages) for your need. It easier to maintain because (still IMO) you maintain components, not the whole app. It’s easier to test, find bugs, etc. React doesn’t do things by default, it just handles the views (providing components and methods). You can make your app grow without fearing maintainability/performance issues. The React Team has some other exciting projects: React Native, which makes React a door to code for the web, but also desktop & mobile apps. The last point is: I have no doubt that Angular will be dropped in the next years. Let’s us talk the basic specification first. This will give you a bright idea of the essential features they both having. Since AngularJS is a framework, it gives significantly views and functionality that are out of the box. AngularJS helps you get started more quickly without feeling intimidated by choices. This also helps new developers feel at home more quickly and makes switching developers between teams more comfortable and efficient. AngularJS 2 developed a framework to a platform. Therefore, you can quickly use its components with other frameworks. Additional functionality may be performed just as in the form of components that achieve it completely, so as directives that extend the functionality of the existing element. Basically, AngularJS was created to make it easy to write tests for applications, mainly if you utilize modules, as suggested in the official documentation. Accordingly, AngularJS has a significant advantage of testing ease which gives an extra reason to choose AngularJS. As you come to the bottom of the discussion, now few points are clear to you on both the frameworks. Hence, if you are deciding to choose one of them, then here’s my opinion. If you are trying to develop a basic web app, then both can be used. Still, ReactJS is SEO friendly, real-time and compatible with heavy traffic. Whereas, AngularJS offers smooth development and testing along with reliability. I may not be able to pick a clear winner between the two but let me help you make an educated move based on the scenario. Use Angular, given you have a group of experienced ( moderately or high ) developers who have a good hold on typescript, they will be able to put Angular to good use. Now, most business enterprise applications will require a generic UI which is strongly supported by the architecture which comes with Angular. React, and Angular 2 both are great technologies that give different opportunities in development. Angular 2 is really good at declarative solutions, but it lacks the freedom and simplicity of React. 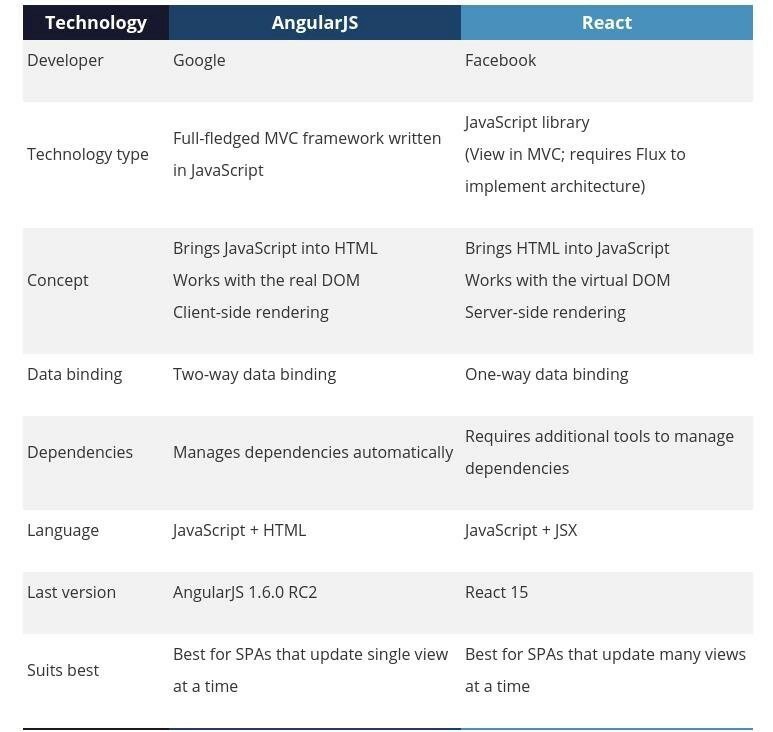 Angular is on the market from 2010 comparing React in 2013, therefore it evident that the first one has a more significant community. Angular recently launched Angular 2 and announced plans for 4th version so we can expect future improvement of the product. Finally, there is no “silver bullet,” you need to choose the right solution that will suit your challenges, goals, and long-term strategy. Great performance. Angular2 — doesn’t make broad object comparison. If items are added/removed to/from an array, change detection won’t detect it. The same for object properties as long as they are not directly bound from the view. Difficulty in learning. If you haven’t used typescript before, you’ll need to learn it and spend time on it. Regular DOM. Angular manipulates actual DOM directly, which makes it quite slow and un-efficient in comparison with React. Total separation of data and presentation. React provides little more than a presentation layer. Although React components do have a concept of ‘state,’ this is best used for ephemeral storage. Easy to start writing. Writing in React is almost similar to writing in HTML. Therefore you can quickly begin coding, skipping all the syntaxis. DOM binding isn’t our concern. If you’ve written any front-end component, with or without a framework, in the past five years then you know the pain of binding DOM elements to functionality. Although React would handle this in much the same way, it would be split across multiple areas of the code with only responsibilities. React isn’t a framework. React is a library which provides a declarative method of defining UI components. ReactDOM is an associated library which offers rendering and DOM diffing. Redux is a library which provides a data store, and React-Redux provides the glue between React and Redux. React isn’t a framework. Again. Philosophy is great, but when you need to get something done quickly, the React Way can be frustrating. If you have clients and projects and pressing deadlines and the first page of your React handbook no longer works (I’ve actually seen this), you can get frustrated. Community conventions are still developing. There are so many problems to solve and React community isn’t big enough to provide all solutions. Website Builder Vs. Website Designer: What Works For You? I like the point that you have mention. 1.As two-way data binding that access singular behavior for the app which minimized risks of possible errors. Anyway, I think it doesn’t matter if you want to learn only one. Both of them are great frameworks & have a vast community behind it. Both of them are backed by giant tech companies, So you won’t get wrong by choosing one of them.